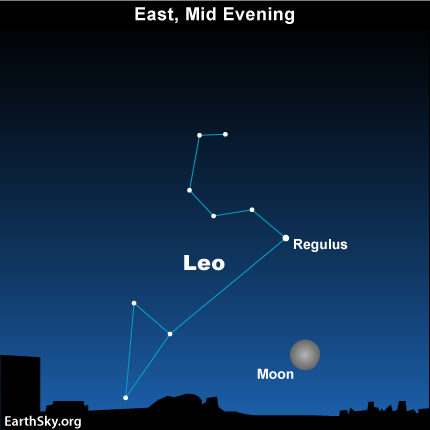 About two hours after sunset on February 18, look for the waning gibbous moon and the constellation Leo the Lion shining side by side over the eastern horizon. The fainter stars of Leo might be hard to make out in the lunar glare tonight, but you should be able to spot Regulus, Leo’s brightest star, and one of the brightest stars in our night sky. Tomorrow, the moon will rise more than an hour later than it does tonight, so the entire Lion should be much easier to see on Saturday. Like the sun, the stars swing full circle across the sky once a day. This movement is due to Earth’s spin under the sky. Unlike the sun, however, the stars return to the same place in the sky in 23 hours and 56 minutes – not 24 hours. This is happening because – as Earth spins – it is also moving through space, in orbit around the sun. 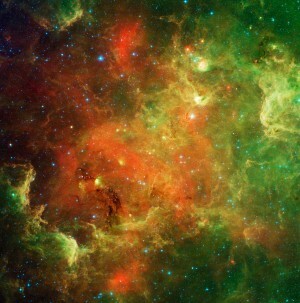 As we move, our night sky points out a constantly changing panorama of the Milky Way galaxy. The 4-minute difference between the return of the stars (sidereal day) and the sun (solar day) may seem insignificant, but this discrepancy adds up over time. Because of it, we associate certain stars with certain seasons of the year. If the stars returned to the same place in the sky every 24 hours, we would not have seasonal constellations. In short, the stars rise about 4 minutes earlier with each passing day. One month from now – around the March 20 equinox – the stars of Leo the Lion will rise some 2 hours earlier than they do tonight. That means Leo will appear above the horizon as soon as darkness falls sometime in March. Leo’s presence over the eastern horizon at nightfall is a sure sign that springtime is about to return to the northern hemisphere. How do we know about our galaxy’s shape? It’s about one month before the spring equinox right now, so look for the moon and Leo the Lion – the springtime constellation – in the east about an hour after nightfall. Then watch for these stars to rise earlier in the weeks ahead. Site contents copyright © 2019 Recorder Online	except as noted. All rights reserved. | 88 queries in 2.464 seconds.